The New Orleans Daiquiri Festival has been postponed until next Saturday (Aug. 24). The event was supposed to be held today from noon to 9 p.m. but the organizers posted on their Facebook page that a permitting snafu delayed the event. Celebrate your new New Orleans home with a frozen daiquiri tomorrow (Saturday, Aug. 17) in the Marigny. The 3rd Annual New Orleans Daiquiri Festival is from noon to 9 p.m. at the Michalopoulos Studio, 527 Elysian Fields Avenue at Chartres (map). The event focuses on frozen daiquiris and will have at least six different varieties for sale. Plus, the fest has music and food. We’re eating our way through New Orleans with the #NewinNOLA crew. Venues this week were Laurel Street Bakery, Bouligny Tavern, Hansen’s, Bacchanal Wine, Seki Sui, Sucre, Mona’s, Cafe Adelaide, Cochon Butcher and Dat Dog. And we had a massive intake of food (cheese!!) Saturday. So good and so bad. Check out our Storify post with all our food pix. We’re eating our way through New Orleans. Venues this week included Booty’s, Salu, Lucky Rooster, Middendorf’s and P’s and Q’s. Check out our full post on Storify. We started last week at Booty’s Street Food (@Bootys). 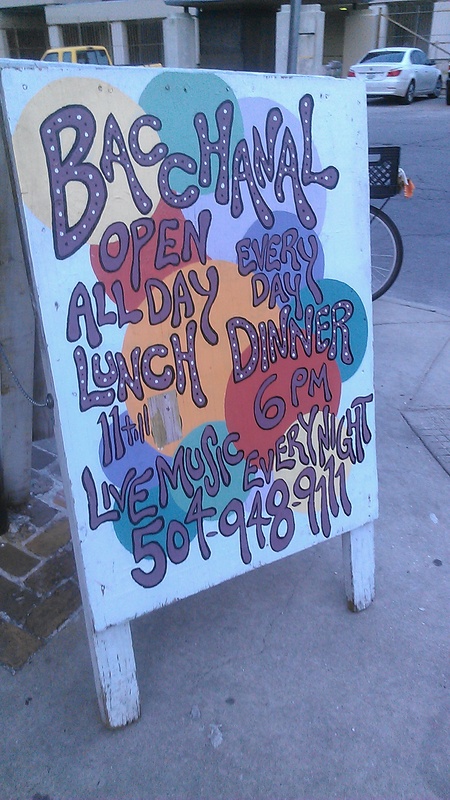 The Bywater restaurant is doing a weekly menu around a specific country. Last week it was Singapore and Booty’s tweeted the magic words: Hainanese chicken rice. New Orleans is a foodie city and we eat out quite a bit. It helps us give good recommendations when our out-of-town visitors ask us where they should eat. Here’s some photo evidence of our culinary adventures this past week or so. Check out the full post on Storify for the prettier version of the photos. We tried Bacchanal Wine for the first time. Had a fun #NewinNOLA meet-up and eat-up. We had our first experience at Bacchanal Wine last week through our latest #NewinNOLA meet-up. We had the perfect weather to sit outside under the trees, drink wine, eat cheese and meet new people. Plus, we got to mark another restaurant off of Eater.com’s list of 38 Essential New Orleans restaurants that we’ve visited. Hope you are able to join us for our next meet-up and eat-up. Our gatherings are geared toward new residents, but we welcome everyone. We’ll post details soon about our next gathering. We had several people give us tips before we went to Bacchanal and we learned some more while we were there. If you have more advice, we’re all ears. Leave us a comment. 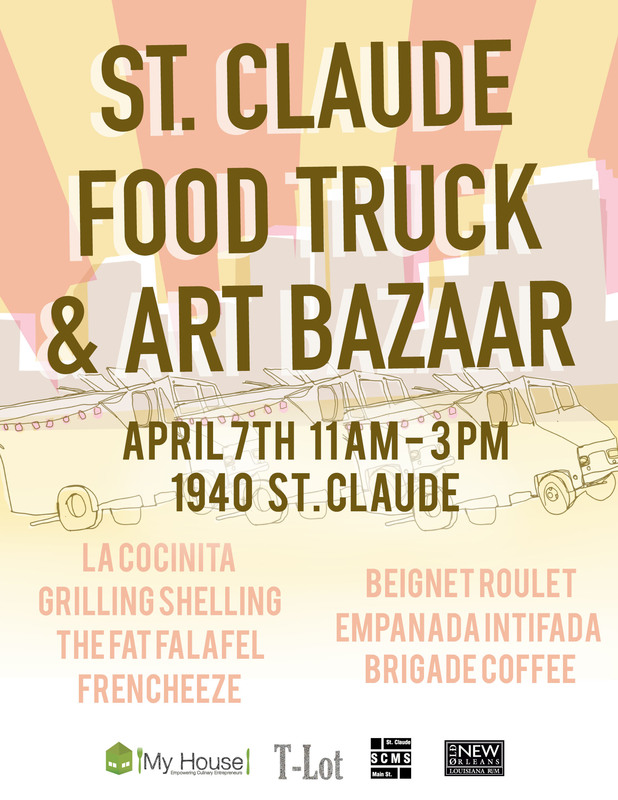 Several New Orleans food trucks are meeting up Sunday on St. Claude Avenue in the Marigny. We’re going and we’re making it an unofficial #NewinNOLA meetup. Come hang out with us and try the food. 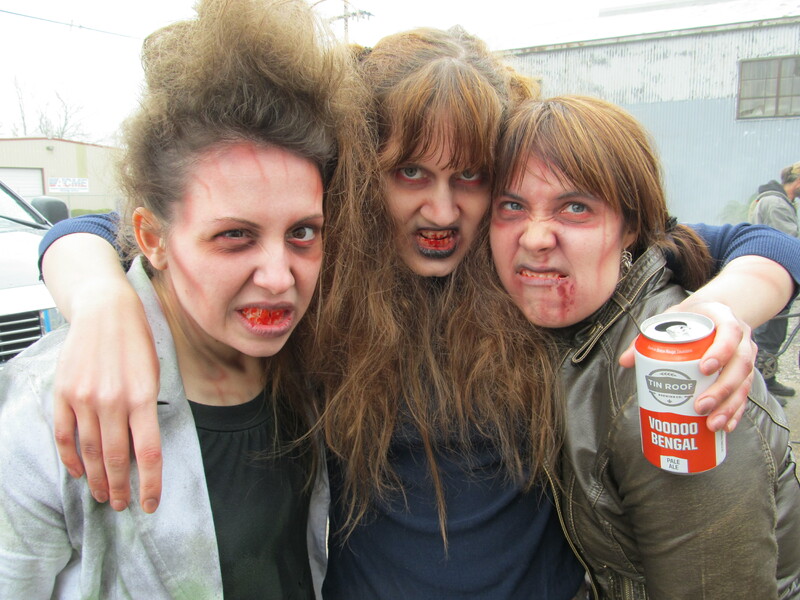 A zombie version of the Harlem Shake video meme? Yes, please. New in NOLA’s Laura had to check things out first hand. I’m a huge fan of gratuitous selfies — it’s gotten to the point that I’m convinced the only person who knows how to take a flattering picture of me, is me. And I have absolutely zero shame about posting my self portraits to Facebook. My good friends indulge me with a smattering of “likes.” My tolerant acquaintances greet my bursts of vanity with silence. On the last Saturday in February, however, my pic du jour elicited a radically different reaction. 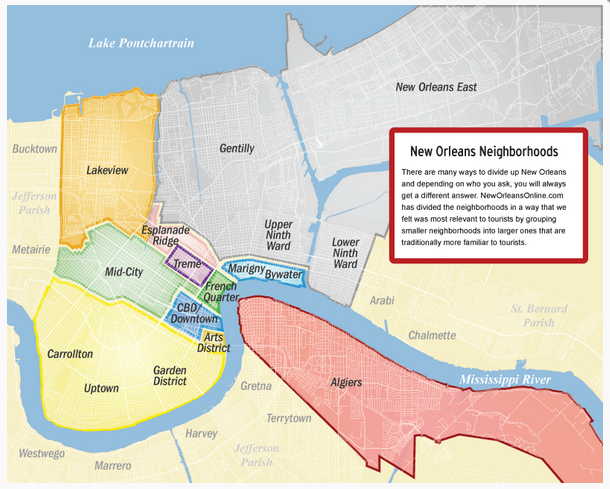 This neighborhood map of New Orleans has been tremendously helpful. Where is Mid-City? Bywater? Uptown? Storyville Apparel has a more detailed map. 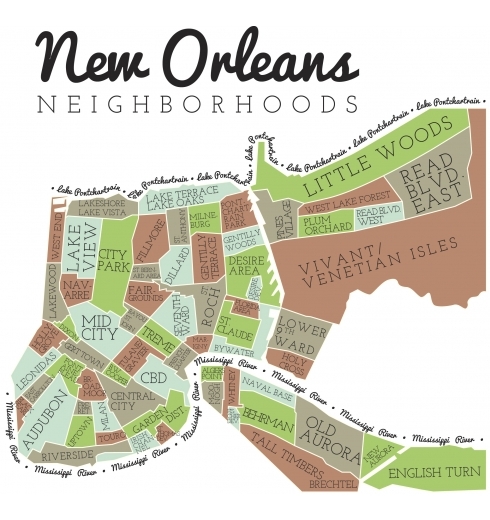 And, you can buy the T-shirt version of this map via Storyville.